Too early to connect the dots. Which you say after somebody mentions dots on Arnie's face. Very "subtle" pun there. It would still be a better chase scene than the one in T3. I much preferred that to the chase scene in Matrix Reloaded. I happened to like the chase scene in Reloaded, though that could come from the fact that it ended with that Morpheus/Agent fight on top of the semi trailer. I'm looking forward to the new trilogy but at the same time it isn't necessary. They very easily could've continued after Salvation. T4 was a good film and I like the direction they took the series, making it about the war and moving away from the overdone time travel plot. I hope Arnold is only in the first one and they have a younger cast for the sequels. I want Arnold to go and do The Legend of Conan already!!! I've done that since long before joining MI6 Community. Oh, yeah, you screwed up the quotes. Thunderfinger said it was too early to connect the dots, and I called it a "subtle" pun. Never mind Thunderfinger, he's a bit dotty. How long has it taken you to make that connection? I could spot it straight away. Hollywood does like casting us Brits as the baddie so could Smith be playing the T-1000? I love it. A fantastic actor. That would certainly be a massive leap for Matt?! Fair play to him if he pulls it off?!!! Wow, I was already looking forward to this film, but now my anticipation has grown significantly. Great actor, Smith. Loved his take on the Doctor. At least they're adding in new things and actually reinventing it. I would hate to go see a shot-for-shot remake that doesn't capture what made the initial two films so incredible. If you're going to reboot/remake it, make it your own. I don't like the leather outfit he has on, but wow, is he ripped. There is something odd about it, isn't it? Looks almost like those cheap leather jackets you see at the mall. Agreed. The pants are way too big and baggy and the shoulders on the jacket just look very tacky, exactly like something you'd find at the mall for dirt cheap. Very impressive. Now all I want is a good film. You and I both. Let's hope the film ends up looking as good and grand as Arnie's muscles do! Real happy to see he actually put on muscle for the role. Nice to see he's hitting the gym again. Considering how old the man is? He is in fantastic shape! Right? His biceps are ridiculous. I can't wait to see him in the film. Let's just hope that he keeps that stoic presence of the Terminator and doesn't change up anything else about him. it's nothing more than a set up for a reboot for the whole series. I for one wanted to see more of Bale's world...what a waste? A time lord to the equation does make it a tiny bit more interesting ....his character is supposed to run through the new trilogy...an alternate time line awaits us. naaah just watch the new xmen movie for that. I wanted to see more of the Bale world too! Storywise it could fit, if T800 got himself some clothes the way Kyle Reese did in the first movie. "You see, it´s all psychological. You yell re-boot, nobody´s paying attention. You yell Terminator Salvation, we´ve got a panic on our hands on the 4th of July." Let the theories commence!!! First REAL images of Arnold, Reese, and Sarah have been released. I'm even going to put them behind spoiler tags- you'll see why if you dare to look. 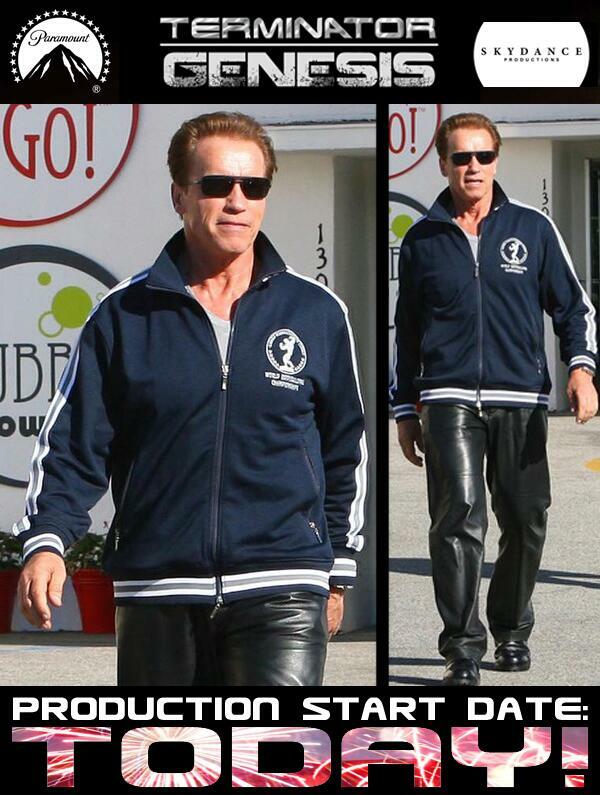 I'll tell you this much though- Arnold looks good, and he's not wearing that odd leather jacket and loose pants- so that's a plus! I'm intrigued, if nothing else. Thanks for the pics, Master! Yeah, Reese looks like Arnie's stand-in!